at the Mound City, Arkansas landing opposite Memphis, Tennessee 1910. The ORGAN was built at Dubuque, Iowa in 1897. In 1918 she was converted into a towboat named DAN QUINN. 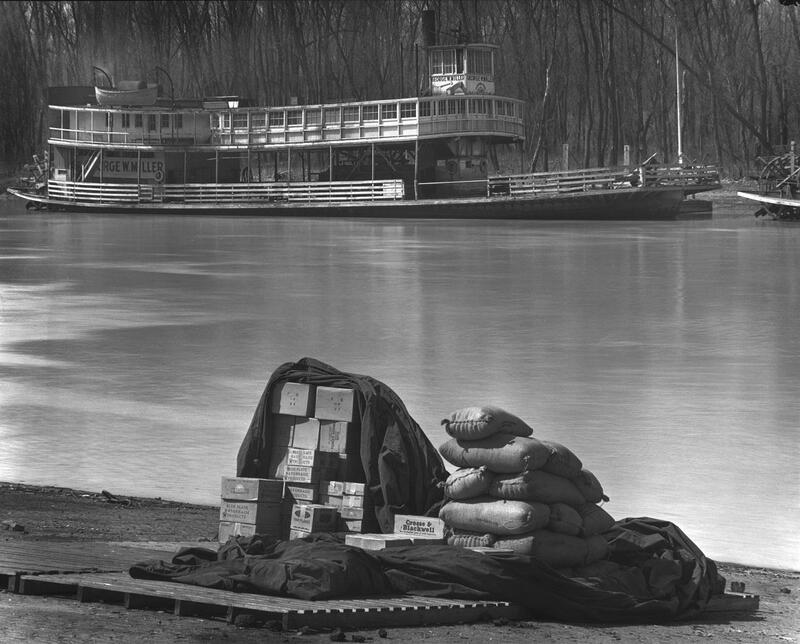 Attached celebrated photographer Walker Evans classic photo of the GEORGE W. MILLER taken at Vicksburg, Mississippi in February 1936. A lot of contrast and brightness adjustments had to be made from the large format that is reduced here. For comparison's sake am also attaching a La Crosse photo of the MILLER from the 1920's before her boiler deck was glazed in with windows. It appears that a dump truck is dropping tar on the main deck to surface it for traffic traffic from vehicles. "Ferry GEORGE W. MILLER and wharf goods"
Walker Evans (November 3, 1903 - April 10, 1975) was an American photographer and photojournalist best known for his work for the Farm Security Administration (FSA) documenting the effects of the Great Depression. Much of Evans's work from the FSA period uses the large-format, 8x10-inch camera. He said that his goal as a photographer was to make pictures that are "literate, authoritative, transcendent". Many of his works are in the permanent collections of museums and have been the subject of retrospectives at such institutions as The Metropolitan Museum of Art or George Eastman House. Built in Grafton, Illinois by Midwest Boat & Barge Co. in 1925. 123 , 30 x 4.3. Compound engines, 12's, 48's - 4 feet. One boiler, coal burner. Carried 24 autos. Originally operated at Cape Girardeau, Missouri,then at Greenville, Mississippi, until bridges were built in those cites and then was taken to Helena, Arkansas, owned there by Capt. A.C. Johnson and operated by Charles Halbert. Burned in May of 1960. Detail from a Detroit Publishing photograph No. 5754 entitled "Steamboats Along the Levee, New Orleans"
Two boilers, each 42" by 22 ft. 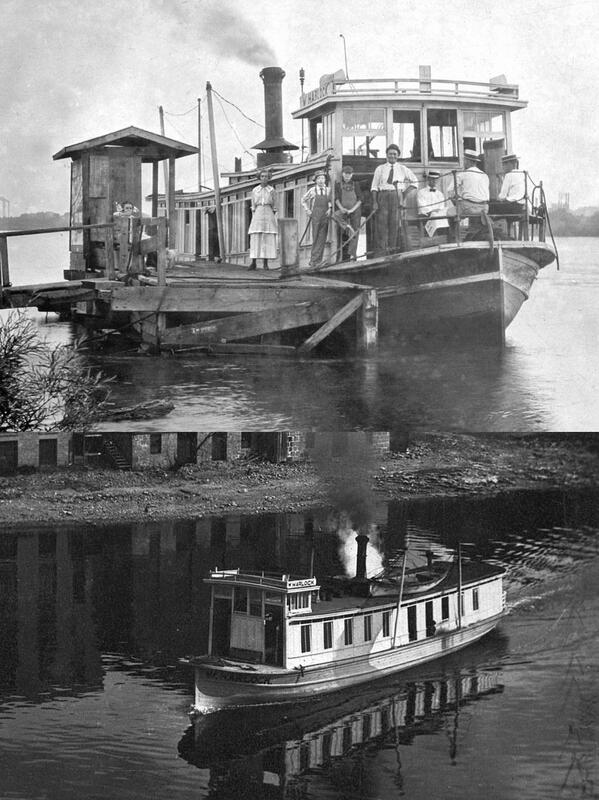 Owned by Union Ferry Co., New Orleans, then Algiers Public Service Co., and finally by Jackson Ave.- Gretna Ferry, Inc. Handled 50 cars and 250 passengers, and burned fuel oil in her latter days. Lost Sept. 9, 1965, during Hurricane Betsy, approx. 100 miles above the head of the Passes, Mississippi River. The two packets behind the PICKLES are the IMPERIAL and the CHALMET. Alongside the 2 packets are 3 tugboats. Built at Athalia, Ohio in 1924. 64.7 x 18 x 8. Parts of the dismantled ferry WHISPER were used in her construction. 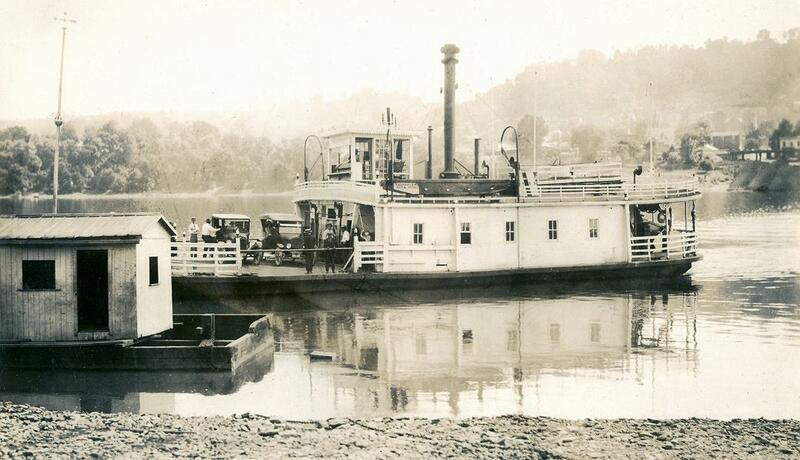 Owned by the Beckett Bros. and ferried at Athalia, Ohio on the Ohio River. Still listed in 1929. From a friend in Alton, Illinois. The ferry MILL BOY had a rough and ready, home-made quality. Here she is as a "luxurious" excursion boat. The passengers got to use their imaginations. "Str. MILL BOY and BARGE #1. Excursion from Washington to Augusta, MO. August 19, 1908"
41 tons. 89.2 x 18.8 x 2.8. Engines, 8" 2 ft. One boiler. Owned by Frank Blaske and others. Destroyed by ice in winter quarters at the head of the chute opposite South Point, Missouri on the Missouri River, on January 1st, 1910. Owned 1906 by the West Memphis Ferry Co. Rebuilt in 1907 after having been caught on a ringbolt during a flood. Capt. Miles Bridgewater was master at Memphis in 1902. Off the lists by 1910. "STR. C.H. 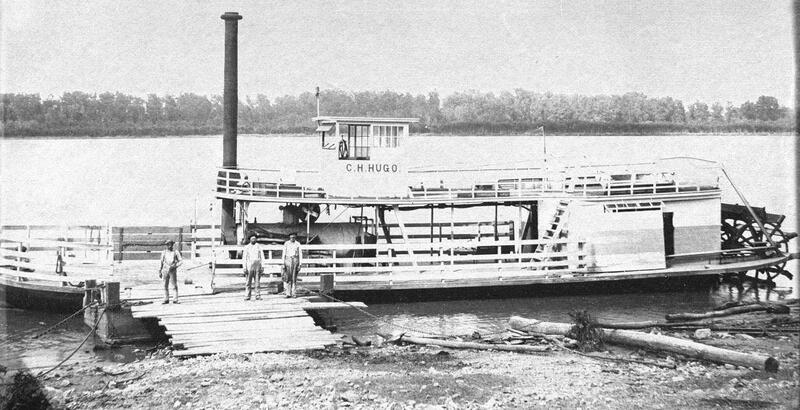 HUGO Built by Frank L. Blaske at New Haven, Missouri (on the Missouri River) in 1895." Two photos by John Miller of the cabin aboard the former steam ferry CITY OF BATON ROUGE provided by co-owner Carrie Stier in recognition of the recent Centennial celebration of the ferry which serves as wharf boat for the riverboat TWILIGHT at LeClaire, Iowa. The classic nautical architecture of the arches and skylights evokes a nostalgic glimpse of what passengers experienced on steamboats in the Mississippi valley during their long golden era on our inland waterways. Adapted from an article in the Quad City News: Centennial birthday celebration and re-christening of the "City of Baton Rouge"
A centennial birthday celebration and re-christening of the former steam-powered ferryboat, City of Baton Rouge, was held on Saturday, May 28, 2016 at 1 p.m. on the LeClaire riverfront. Hosting the celebration were Captain Kevin and Carrie Stier, co-owners of the Riverboat Twilight. Local river historian Judy Patsch served as christening official. Travis Vasconcelos, riverlorian and acting docent, gave a performance on the calliope. Historical commentary was provided by the editor of the S & D Reflector, Dave Tschiggfrie. 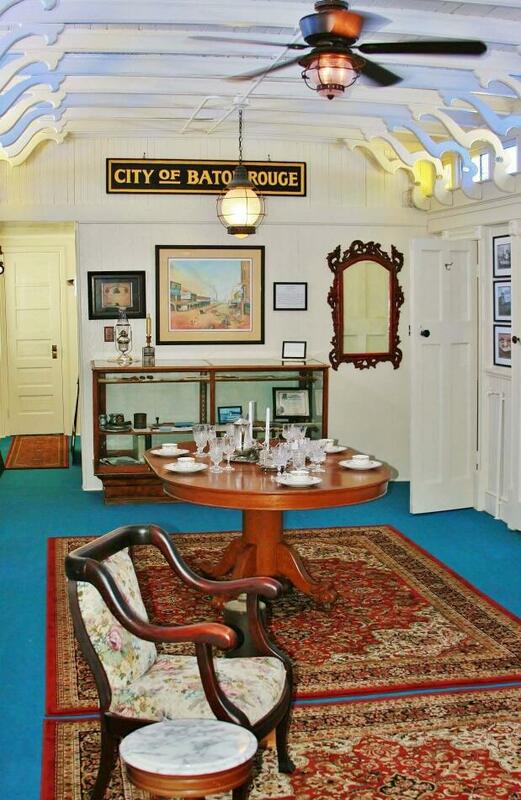 The City of Baton Rouge was built in 1916 at the Howard Shipyard in Jeffersonville, Indiana, for the sum of $22,000. 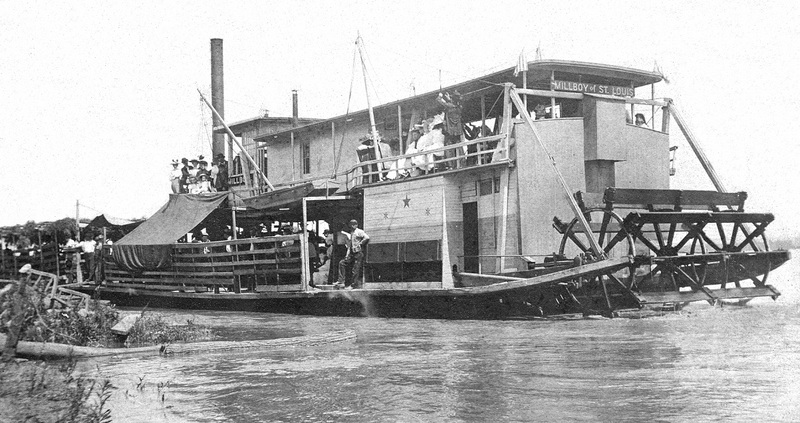 Operated by the Baton Rouge Transportation Company, she served as a ferry boat on the lower Mississippi river between Baton Rouge and Port Allen, Louisiana. Her steam engines were manufactured in 1915 by the Gillett, Eaton and Squire Company of Lake City, Minnesota, and were required as part of the building contract to provide enough power to make a seven-minute crossing between the two landings. She has a catamaran hull and was formerly powered by a single center paddle wheel. The City of Baton Rouge had a capacity for 500 passengers and 21 cars. She operated as a ferry until April 1968 when the opening of a new bridge over the Mississippi ended the need for ferry service. About this time, Captain Dennis Trone was just beginning to realize his vision of building an authentic steam-operated riverboat. 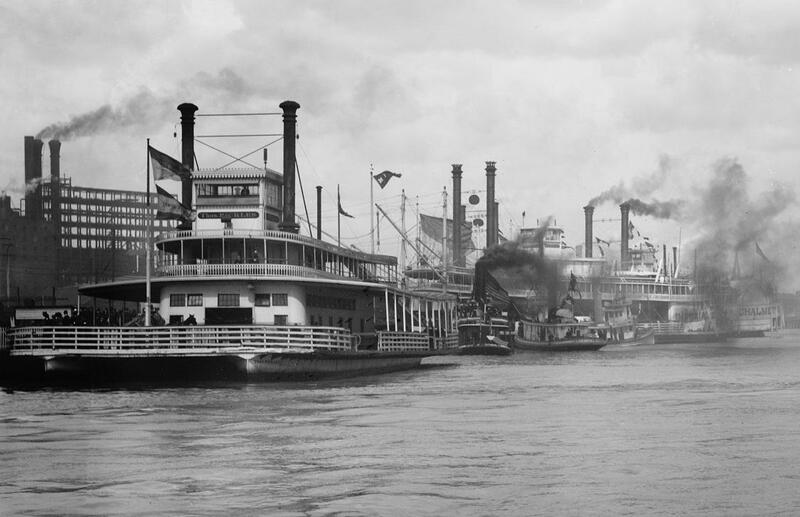 By November 1968, Captain Dennis Trone had completed the purchase of the City of Baton Rouge, and she was on her way upriver to Dubuque, Iowa, to have her steam engines, paddlewheel and other equipment salvaged for use on Trone's new steamboat, the Julia Belle Swain. 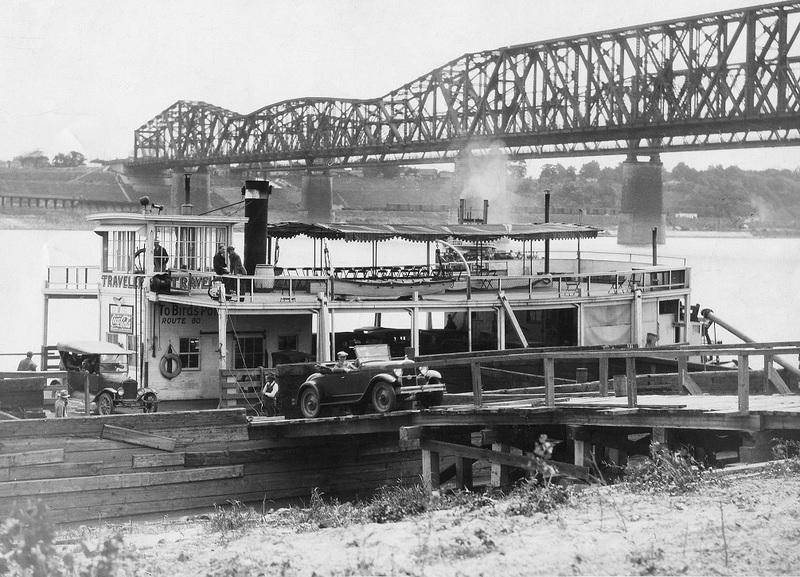 While at the shipyard in Dubuque, the City of Baton Rouge was remodeled to function as a dock boat for Trone's new excursion boat company operating out of Peoria, Illinois. A ticket booth was added, a full kitchen and food storage area was built in place of the center paddle wheel, the main deck was opened up to provide a sheltered area for passengers waiting to board the Julia Belle Swain, and eventually the upstairs passenger area was divided into small staterooms to house the crew. On the evening of August 9, 1980, a strong thunderstorm—some say it was a tornado—blew through downtown Peoria, and the resulting winds tore off the old pilot house and damaged the roof, forever altering the iconic look of the historic ferryboat. 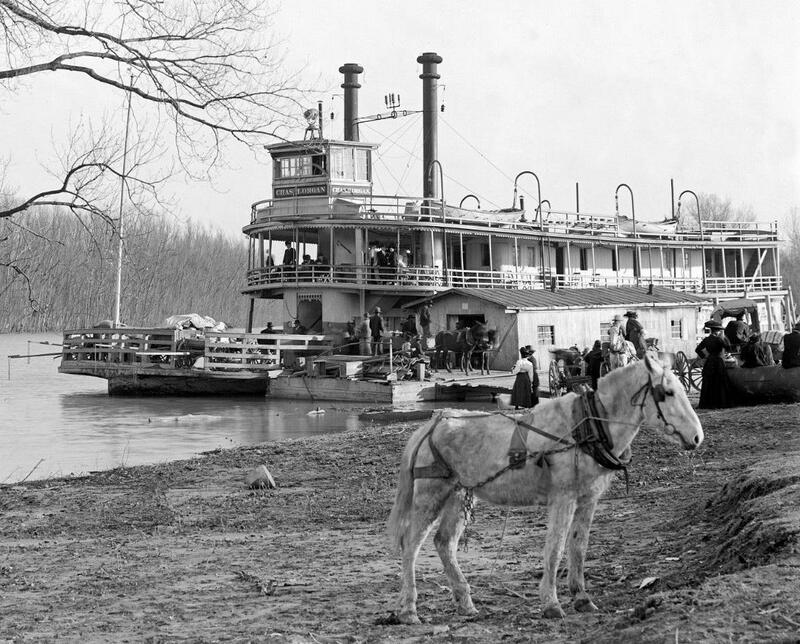 In 1987, the City of Baton Rouge was lashed to the front of Trone's newest excursion boat, the Riverboat Twilight, and Trone's fleet (the Julia Belle Swain, the Twilight, and the City of Baton Rouge) traveled downstream to Grafton, Illinois, and then up the Mississippi River to LeClaire, Iowa. The trip of almost 435 river miles took three full days. Traveling through the night required excellent piloting skills as the Twilight was most definitely not designed to do the work of a tow boat. Once the trio arrived at LeClaire, the City of Baton Rouge was permanently moored to the shore and began her third career as the home dock for Trone's Mississippi River cruise operations. She continues to this day to serve as a passenger boarding area for the Riverboat Twilight. She also serves as storage area, workshop, and crew accommodations. Her second deck has the best seat in the house to watch LeClaire's annual TugFest fireworks. During the centennial re-christening, in addition to celebrating 100 years of service for the City of Baton Rouge, the former ferry was also re-dedicated her to her last "Captain"— Captain Harry Alsman, who passed away in August 2014. One of the first LeClaire residents to come down to the riverfront to welcome the new riverboats to town, Alsman ended up with a second career, lifelong friends and countless memories. 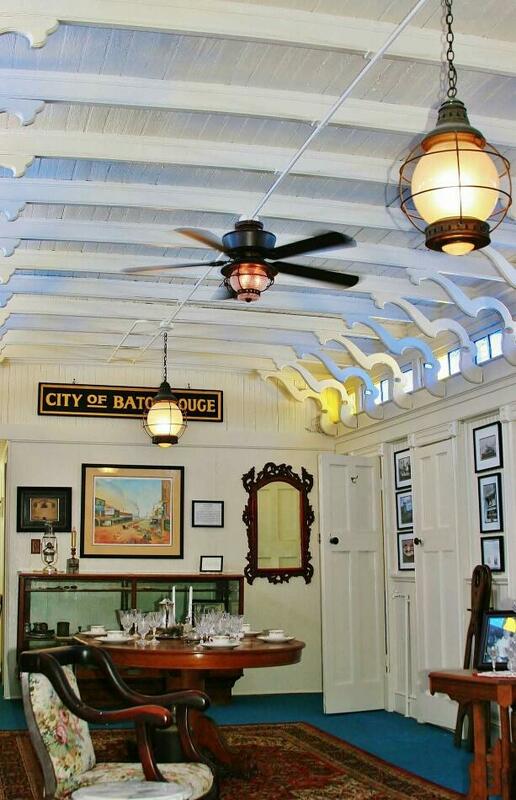 He and his wife, Joanie, assumed responsibility for the City of Baton Rouge and the grounds where she was moored. Joanie started a beautiful garden, and Harry made sure the boat looked her best and was present to welcome every passenger. Harry Alsman hauled the lines back to the wharf, waved to the passengers at every departure, and was always on time to throw out a line when the boat returned to the City of Baton Rouge. He knew every crew member and often just shook his head at their antics. He drove the crew to the bus station, the mall, the doctor, the hospital, and anywhere else they needed to go. He was a father figure, a shipmate, a co-conspirator, but most importantly, a friend to everyone. 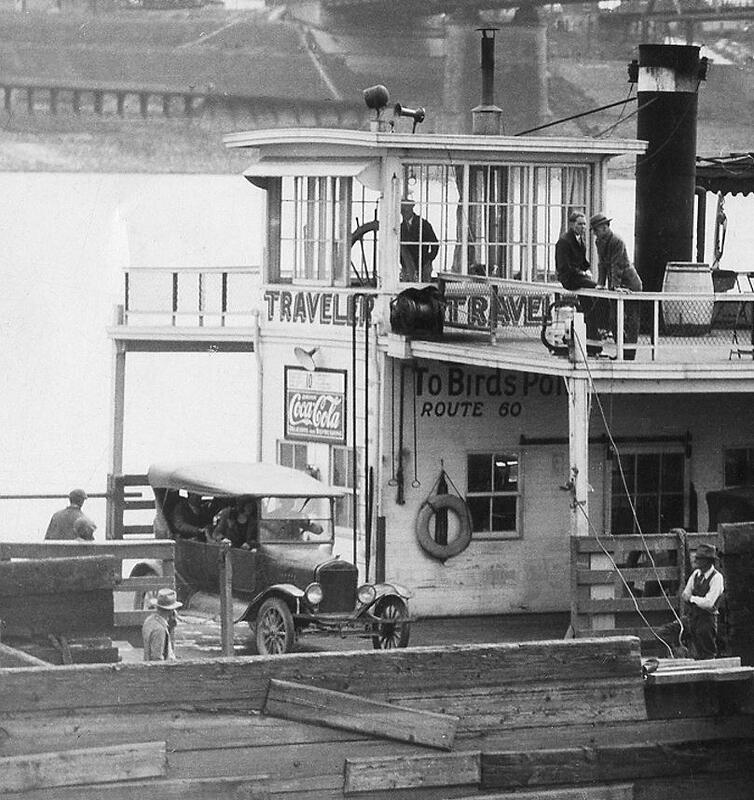 The signage "BIRD's POINT Route 60" under the pilot house led me to the locale where the 1927 ferry TRAVELER operated between Cairo, Illinois and Bird's Point, Missouri. I am a lifelong resident of Charleston, Missouri. I've spent a lot of time in Cairo, Illinois, over the years. The photograph of the Automobile Ferry Traveler on steamboats.com/museum/davet-photos13.html [here] was most certainly not taken at Cairo. Evidence is there were never two rail bridges at Cairo. The two bridges also tie into a riverbank much higher than that at Cairo. It appears to be a bluff on the far bank of the river with buildings on it. On the far bank of the river at Cairo is a low, flat flood plain. Also, this river appears not nearly so wide as is the Ohio at Cairo. There was ferry service for Highway 60 between Missouri and Illinois, and this ferry looks like it was used there. Interesting that it may have traveled further along the rivers or it had been sold elsewhere before this picture was taken. Please, if you find information about where this picture was taken please advise me. Well Mr. Rolwing may be right but I'm not enough of an expert on Cairo and all the other river towns and bridges to know where to begin to guess where else it could've been taken.BIRD's POINT ROUTE 60 is painted on the boat and that is how the connection to Cairo was derived.Perhaps the boat was sold and then moved to operate in another location but the owners hadn't gotten around to painting out the lettering which gave BIRD's POINT as one of the ferry's ports of call. You can add Rolwing's e-mail to the caption under the photo of the ferry TRAVELER where perhaps another river town resident will read it and tell us where those bridges are. Editor's note: good news, we have received more information about the location of this photo from Bill Hunter. Saw the photograph of the ferry Traveler. I agree that there are no double bridges of that type near the Cairo, Illinois / Birds Point. Missouri area. My guess is that this photograph was taken on the Mississippi River from the Arkansas shore looking towards Memphis, Tennessee. The bridges would be the Hanrahan and Frisco bridges built in 1916 and 1892 respectively. Thanks Bill! Appreciate that . . . Dave T.
Neat photo for steam ferry and vintage automobile buffs. The Coca-Cola sign on the front of the pilot house is another unusual detail. Length of largest span: 700.9 ft.
Vertical clearance above deck: 17.8 ft. The image on top is from a real photo post card off eBay, plumbed and cropped to fit above a detail of the same boat from a high angle photo in the Murphy collection. The top image that I bought is more quaint with the rather funky, rough and tumble condition is in. Even without a sternwheel it's an interesting and unusual craft for the Mississippi. The folks posing in the top picture are a great bunch of characters. W. Harlock had the ferry built at Lyons, Iowa and gave it his name. She ran on the Mississippi River between Fulton, Illinois and Lyons, Iowa. Judging from her appearance the ferry could only accommodate passengers and a limited amount of cargo but no vehicles except for bicycles. 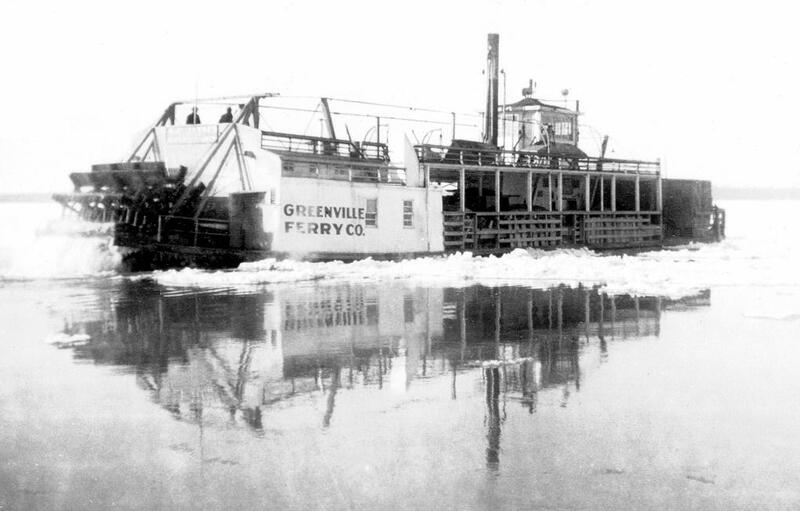 Navigating the ferry's route was made challenging by sand bars and in order to get aboard, customers had a long walk out to the end of the government pier located on the dam near the end of Tenth Avenue in Fulton. 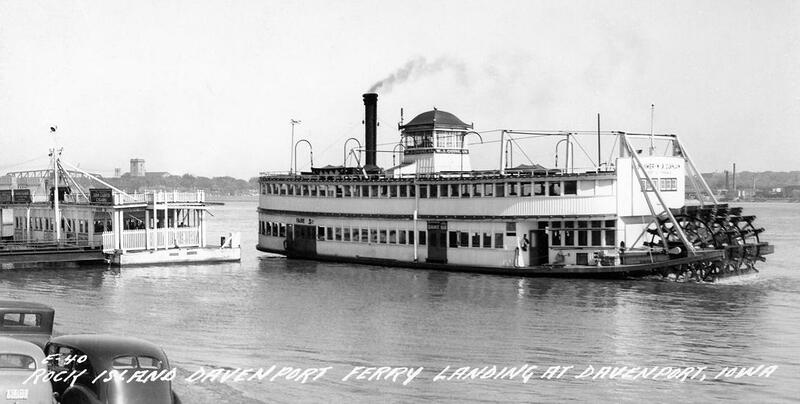 After the bridge company started bus service in 1915, customers for the ferry slackened off. In 1918, the W. HARLOCK steamed away to the Illinois-Mississippi Canal (now called the Hennepin Canal) and later put to work in Chicago. 3 1/2 X 4 1/2 snap shot circa 1920's on what looks like a ferry boat, perhaps crossing the Mississippi in Louisiana from New Orleans to Algiers. Written in bottom margin: "Bobby & His Mother Sailin' Down the Missis(sippi)" tail end of last word cut off with missing corner lower right. If anyone recognizes this boat or thinks that it may belong on a river other than the Mississippi I'd be glad to hear from them. It's possible that whoever wrote the caption was just joking about this being on the Mississippi. Mother looks a little annoyed and Bobby not much pleased either. As if they were saying to the photographer "Choose your words carefully before you speak to us again Mister!" Behatted and besuited gents seated on the bench further down the deck. A metal awning extends out over the side from the deck above which probably provided shade on sunshiny days. When one thinks of past Davenport ferryboats, the one that usually comes to mind is the W. J. QUINLAN. This beautiful steam-powered stern wheeler, built in 1904 by the Kahlke boat works in Rock Island, Illinois, was originally named the DAVENPORT. In 1925, William J. Quinlan bought the boat, refurbished her, and renamed her after himself. of the river—plus the use of its dance floor and casino— to couples and gamblers. hull, and retired to the Kahlke yard in 1946. The QUINLAN was lost in a dry dock fire in April of 1967.